A Smart Template in codeBeamer ALM works very much like a smartphone app. Smart Templates use codeBeamer’s resources, capabilities and artifacts such as workflows, roles, trackers, forms, documents, wikis and integrations to help you achieve specific goals. Using a Smart Template is a good way to get started with codeBeamer ALM, as templates give you predefined configurations but can be flexibly configured and customized later on. Projects in codeBeamer ALM can be exported and imported as Smart Templates along with the workflows, configured trackers, roles, forms, documents, and wikis used by the project. This allows you to simply download Smart Templates, import them into your codeBeamer ALM instance, and thus implement mature processes in a matter of minutes. You can further customize these templates to match your team’s specific needs. You will not need any programming or scripting experience to use Smart Templates. REST API is also available, allowing you to extend the templates to handle third party applications. 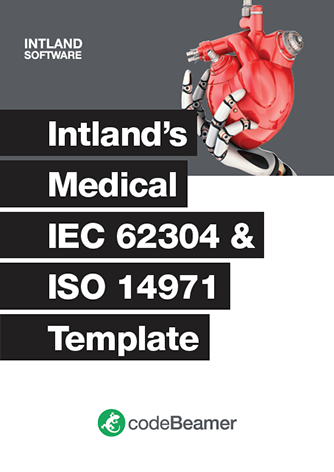 Intland’s Medical IEC 62304 & ISO 14971 Template is customized for compliance with IEC 62304, and also supports adherence to the requirements of FDA Title 21 CFR Part 11, ISO 14971, and IEC 60601. It was developed with the aim to address the special needs of developers and manufacturers of medical technology products. 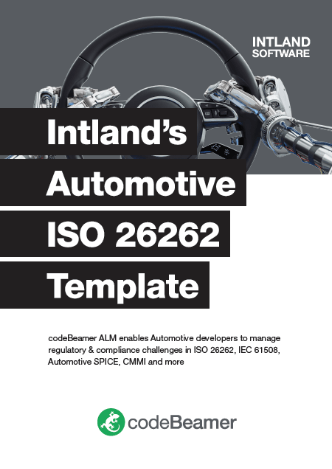 Intland’s Automotive ISO 26262 & ASPICE Template was designed to help you achieve compliance with the international standard ISO 26262, and adhere to the requirements of the Automotive SPICE and CMMI models. The template, which leverages the capabilities of codeBeamer ALM, enables you to develop safety-related embedded automotive systems up to ASIL D or SIL 3. 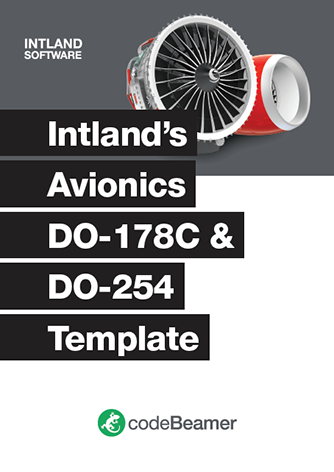 Intland’s Avionics DO-178C & DO-254 Template provides out of the box support for compliance with the requirements of avionics standards DO-178C and DO-254. The template was designed to help developers of avionics embedded systems ensure the quality, safety and reliability of their airborne products. It contains preconfigured work items, and allows you to specify and enforce the use of compliant avionics development processes. Intland’s Pharma GAMP® 5 Template supports the application of a risk-based approach to the management of compliant GxP computerized systems. It helps pharma companies, suppliers, and system integrators ensure that the systems used in pharma projects are fit for intended use, and comply with the requirements of the Good Automated Manufacturing Practice® 5. Scaling Agile across large organizations is a difficult task. For enterprises looking for a safe and smooth way to transition to Agile, one that lets them keep organizational structure and control over their teams, the Scaled Agile Framework (SAFe®) is a great solution. 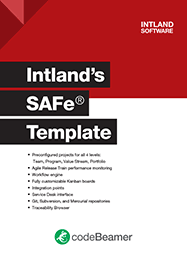 As the first implementation of the Scaled Agile Framework in the Agile world, Intland’s SAFe® Template offers a dedicated template that supports adherence to this complex framework, and enables you to manage and monitor the work and performance of multiple Agile Release Trains in a convenient, easy to overview manner. 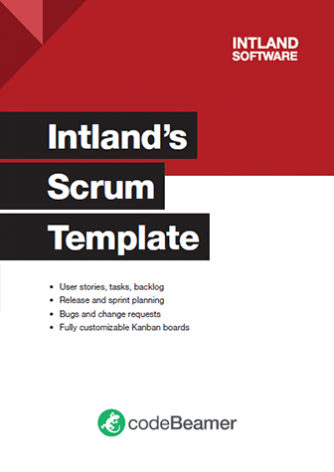 Intland’s Scrum Template (included with codeBeamer ALM out of the box) was created to support teams working under the Agile framework with Scrum and Kanban. It offers various features to support Agile development, providing a great basis for any Agile project. Agile/Scrum and Waterfall/V-model seem to be methods with really different fundamentals, but they may be complementary for complex, multi-tier system development. In most cases, hardware components are developed using a Waterfall/V-model method, while the development of software components can be managed with an Agile approach. 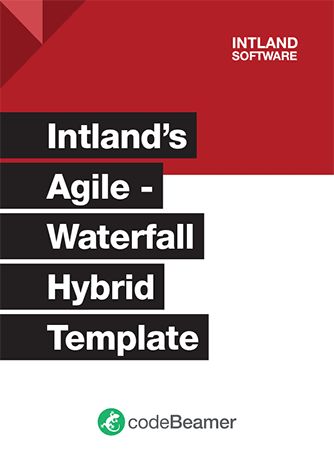 Intland’s Agile-Waterfall Hybrid Template (included with codeBeamer ALM out of the box) is able to support both of these, as well as the combination of Agile and Waterfall in a custom Hybrid method. This package contains all the Use Cases and related manual and automated Test Cases used by TÜV for qualifying codeBeamer ALM. This package can be used to support your own tool qualification process, cutting the time and costs of validating your ALM tool for use in safety-critical development.